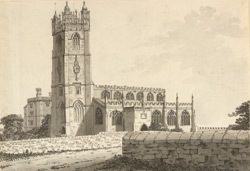 A south-west view in ink of St Mary the Virgin's church from Thornbury Castle in Gloucestershire, drawn in August 1789. The building of Thornbury Castle was begun in 1511 by the third Duke of Buckingham, Edward Stafford, and ended in 1521 when he was beheaded by Henry VIII. Buckingham's vast estates, including Thornbury, were confiscated by the king who stayed here with Anne Boleyn in 1535. Henry's daughter Mary Tudor, lived here as a princess and when she became queen she returned the Castle to the descendants of the late duke. The building is now a hotel.